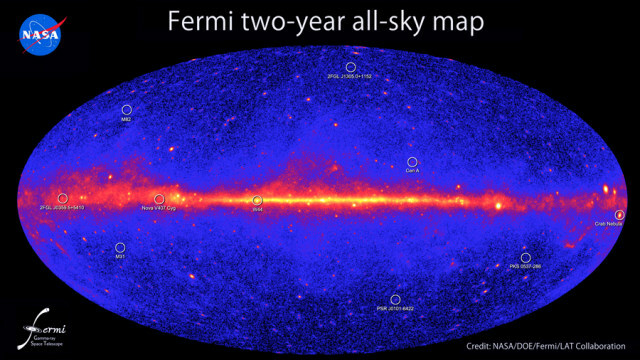 This all-sky image, constructed from two years of observations by NASA's Fermi Gamma-ray Space Telescope, shows how the sky appears in gamma-ray light. Brighter colors indicate brighter gamma-ray sources. A diffuse glow fills the sky and is brightest along the plane of our galaxy (middle). Discrete gamma-ray sources include pulsars and supernova remnants within our galaxy and distant galaxies powered by supermassive black holes.